A loan of $125 helped to buy fabrics and needles to expand her embroidery work. Nisolat is 55 years old and a widowed woman. She lives with her three children. Nisolat doesn't stay idle, but embroiders cloths and fabrics from home. 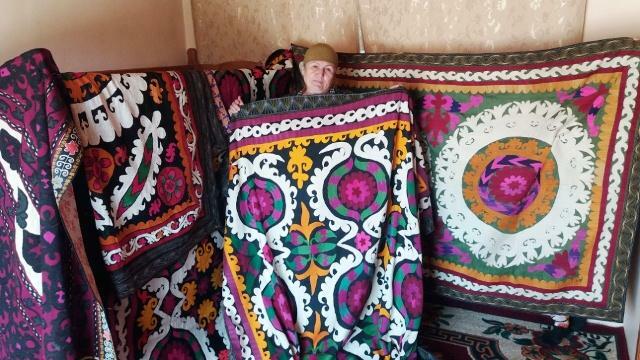 She practices a type of traditional embroidery called gulduzi and receives many orders. Nisolat has spent many years raising her children. Now that they are older, she has more time to devote to her needlework. She wants to buy a large quantity of fabrics and needles for her embroidery work. Thanks to this loan, Nisolat will be able to fulfill more orders. It allows Tajik artisans to support their families and carry on important handicraft traditions. This loan is a part of IMON's efforts to support artisans and their families upholding important Tajik traditions. Tajikistan has a rich tradition of artisans with beautiful folk crafts that have been passed down through multiple generations. By supporting this loan, you are not only supporting a family in a rural area, but also promoting and renewing cultural artistry.